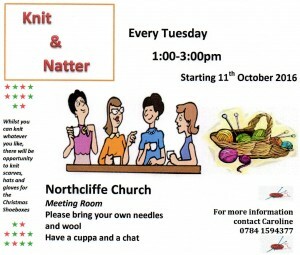 Welcome and greetings from the people of Northcliffe Church. We are a mixed fellowship of people from two churches that got together in 2009 to form Northcliffe Church. Northcliffe is a United Reformed and Methodist Local Ecumenical Partnership or LEP. Our link Minister, Rev Nick Blundell, is one of the Bradford North Methodist Circuit Ministerial Team. Nick is Circuit Superintendant and is attached to Northcliffe and two other Methodist Churches. We are proud to have been granted the Child Friendly Church Award from the URC. We are also a member of the Additional Needs Alliance. We welcome all people to our fellowship. Caroline Pathak, our Lay Pastor / Host Evangelist joined us in August 2016. She supports the fellowship at Northcliffe to strengthen their belief and share their faith. Caroline works in the Northcliffe and wider Shipley Community befriending and supporting those she meets. She has an office at Northcliffe from where she engages with the many church and community groups who use our premises. As an accredited Local Preacher, Caroline also occasionally leads our morning worship. She is a full and valued member of our leadership team. Everyone is valued at Northcliffe and the whole fellowship contributes and gets involved in some way, at some time, according to their skills, strengths and talents. To keep things running smoothly some people have specific responsibilities. Our aim is to support each other and work as a team. Senior Elder and Lay Pastor: Tim Billingsley. As senior elder, Tim takes the lead in certain things at Northcliffe and has his particular responsibilities within Northcliffe and with the Methodist and UR Churches locally and regionally. He also supports the members and congregation in his role as lay pastor and worship leader. He is supported by other office holders and a small leadership team. Treasurer: John Watmough. John is a busy man who looks after the finances for us and for Bradford North Methodist Circuit. Church Secretary: Gwen Billingsley. Gwen records many of our meetings and receives and distributes much of the information that lands in our emails and letterboxes. She works alongside Caroline, as lettings administrator. The Leadership Team: This small group not only supports the senior elder but also represent the broader fellowship. They help to draw up plans and discuss action plans to take to the General Church Meeting for approval or implementation. They each bring personal gifts to the team and are at the core of our service as a fellowship. Team Members: Daniel Barrett, Gwen Billingsley, Tim Billingsley, Adele Dolby, Gillian Fryer, Rebecca Halliday, Christine Howard, Caroline Pathak, and John Watmough. Clive Grimshaw is our link Circuit Steward. Organists: We are led in our worship by our two musicians on our organ and grand piano. Grateful thanks go to June Carter our principal musician and to Howard Hutchinson who plays for Tuesday Church. A Small Team of Leaders and Helpers plan and run our Sunday Club (Junior Church). The children share in the first part of our worship before heading downstairs to their own activities. Please note: All those working with children and vulnerable people are subject to a DBS check and expected to attend Safeguarding training.